Loved working with sweet and sleepy little Xavier for his session. Beautiful! We are bringing some new products into the studio that will be available to clients. We are always striving to find very unique and high end product to our customers. Our Wood Hanging Canvases are made with stunning matte canvas, reclaimed wood, jute and copper accents. Together they produce a beautiful vintage hanging poster unlike anything on the market. The individuality of this product adds charm to any photograph, which ensures the artwork remains the focus and is presented beautifully. Please contact us for your complimentary consultation, so that you can see these gorgeous pieces in the studio today! Loved seeing this sweet family in the studio for their little guy's newborn session. He was such a great sleeper for me, and I'm in love with his newborn session images! I loved seeing this little guy in the studio, and I think he loved it too! Look at that cute little smile. San Diego newborn photography studio. I loved this session so much! I was so happy that mom and dad decided to bring some sentimental items to use in the shoot. I especially loved that they brought mom's wedding day sari (Indian wedding dress) and we used it as a backdrop in one of the sets. SO gorgeous! And the color, loved using so much color! This week is Newborn Safety Week, in our newborn photography circles. I wanted to share with my clients the measures that I take to make sure your baby is safe in the studio. 90% of the poses that I do in the studio are very safe with no risk involved; beanbag shots, and shots of baby in basket laying down surrounded by fluffy and pretty textures. I do like to take bucket shots, and those to require extra safety steps. I won't put baby in this pose, unless his or her arms will easily get into position. I can tell when they will, and when they won't. And if I'm not sure, I might attempt, but I will never let go of baby until I'm certain he or she is not going to move. In this particular pose, I prefer to have a parent "point" with a finger, and support baby's head. I would rather edit out a hand than have baby startle and have an issue with safety. So, there you have it - a before and after in one of my favorite baskets/props. Sweet Sloane did a wonderful job during her session. She was so sleepy for me... and just look at this smile! LOVE! 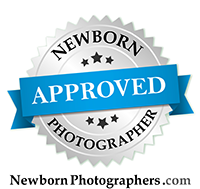 For more information on our Carlsbad Village newborn portrait studio, please contact us! Ryan came to me at three and a half weeks old! He was such a little cutie, and did a fabulous job for his session. 20 month old big brother joined in some photos as well. So darling! If you're expecting, its not too early to get your newborn session booked in advance! I take limited sessions each month, so be sure to contact me early. Carlsbad newborn photography studio. Loved meeting this lovely family, and photographing their newest family member. So sweet! And a few more images, using one of my Mia Joy rompers, and a gorgeous backdrop by Intuition Backgrounds. Sweet little Kai came to me at 7 weeks adjusted... he was born at 33 weeks. And... he slept for me so well! Such a little darling.